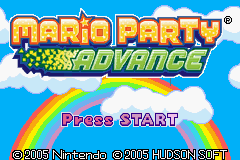 Mario Party Advance bears very little resemblance to the console Mario Party games. There's very little multiplayer support, no real game boards, and the bulk of the game is a single-player game mode. This icon appears in both the mini-game and Gaddget icon set. It was likely used to mark minigames that weren't implemented. This text appears next to the standard pause menu graphics. The hiragana translates to "Please turn the power off". This might have been used for a Sleep function, or a placeholder. The kanji at the top-right appears to say "English", likely to note what text block it appears in, though obviously they didn't translate the text. Both of these icons are placed with the rest of the Gamble minigame icons. It seems to be a Pachinko game set against a verdant backdrop. It could have been for a "Bowser's Big Blast"-type game with Bob-ombs. Unfortunately, all of these icons have been crossed off, so their graphics aren't fully intact anymore. which is accessible in-game through unconventional means. An icon of Mr. I, perhaps you could have directed where it looked. Looks like a dumbbell, so it likely did dumbbell things. or possibly some kind of roulette game. These eyes are either above some flames or they're projecting lasers. This is just a temporary icon. This page was last modified on 25 August 2018, at 20:29.